In the year of 1923, the Ronceverte Chamber of Commerce, in coordination with over 50 merchants and professional men within the city announced plans to sponsor an elaborate city wide event. The “Dollar Day and Thirty Day Prize Sale Carnival” was an event meant to attract thousands of people to the city beginning on May 16th and continue throughout the following thirty days. Ronceverte planned to offer the people of the Greenbrier Valley and beyond—greater buying and bargain incentives than any area within a 100-mile radius. During the month long event, every purchase would come with a raffle ticket for a grand prize drawing to be held at the culmination of the event. Three grand prizes would be offered: one 1923 Ford Touring Car, one Victrola, and one set of Hoosier Kitchen Cabinets. There would also be a drawing for thirty smaller prizes. On June 16th, a huge crowd equal to the size of a circus of years ago, was present in town for Ronceverte’s “Thirty-Day Prize Sale Carnival”. Early in the day people began to arrive, and before noon the city was teeming with shoppers, and full of the excitement of who would be the winners of the three grand prizes. The crowd was estimated at 4,000 to 6,000 people. Before two o’clock, the hour set for the drawing, the streets of the city were jammed full of automobiles from curb to curb. 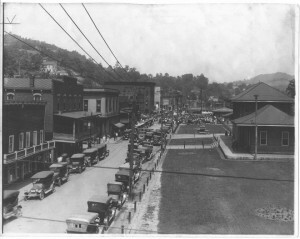 It was reported that over eight hundred automobiles were parked in the streets and alleys. Nothing like this had ever been experienced before in the town of Ronceverte. At 2:00 pm the drawing took place. 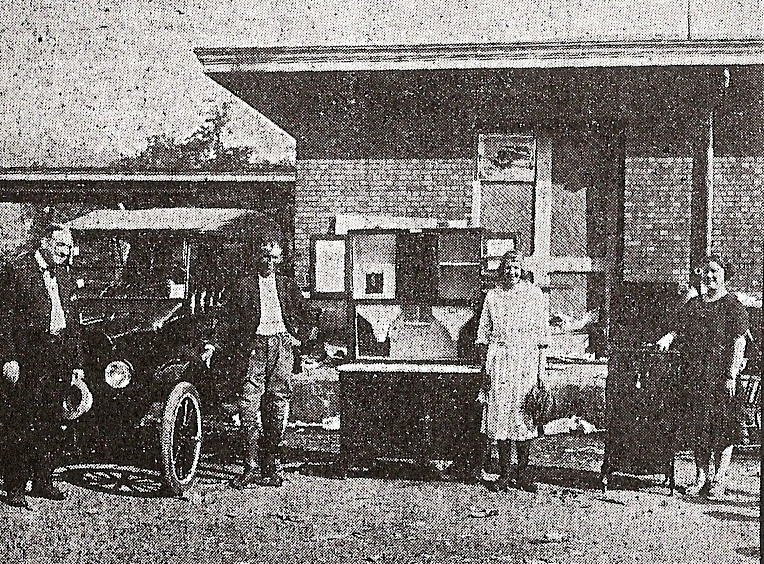 The three grand prizes were awarded to the following: The Ford Touring Car – Oscar Benton Elmore of Sinks Grove, The Hoosier Kitchen Cabinets – Eva Loudermilk of Frankfort, The Victrola – Anna Elizabeth Hager of Ronceverte. As the West Virginia News reported in 1923, Oscar Benton Elmore won the Ford Model-T Touring car that was fully equipped with everything. 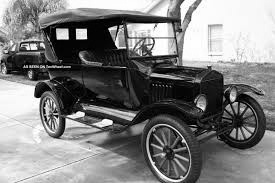 At this time Henry Ford wanted his Ford car to be affordable to every American family. The Ford car originally sold for over $800 and now an assembly line was created and mass production began and the price of the car was dropped to around $300. Benton Elmore was my grandfather. He lived in the Sinks Grove area with his wife Cora and their family. 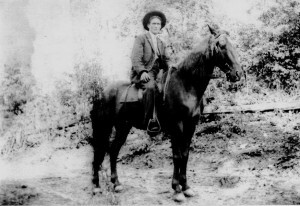 Benton had a love for horses and always owned a beautiful horse. 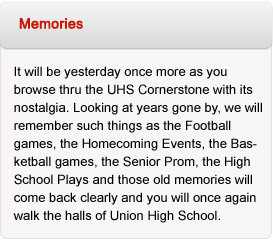 Benton did not know how to drive and had never owned a car. Winning this car was a new experience for him. My grandpa made many attempts to drive the car and the family gave many funny accounts of him trying to learn how to drive, but he soon gave up and continued to ride his horse. The driving of the car was passed along to his two older sons; Teddy and Bernie, which was very common in those days. 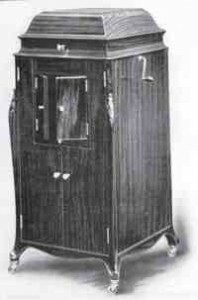 The winner of the Victor talking machine, The Victrola, was won by Anna Elizabeth Hager, daughter of Charles and Martha Hager of Ronceverte. The Victrola was valued at $150. In years to come Anna would marry Thomas Cohernour, also of Ronceverte and they would have a son Robert (Bob) Hager Cohernour. In 1962, I married Bob Cohernour. On June 16, 1923, my grandfather and Bob’s mother crossed paths on that lucky day and this story was never discovered until now….July, 2014. Through the years my dad (Bernie Elmore) would mention something about our grandpa winning a Ford car, but only now do we have the accounts of that day to tell the entire story. Many thanks to the West Virginia News, located in Lewisburg, West Virginia.